As a child, I knew that I would someday pick up photography as a hobby. I never envisioned myself as a photographer – always a writer – but there was something about the power that a photograph can hold. The way you can view a photo from a time that you don’t remember as a baby or a photo you took yesterday and the image can evoke emotions that you thought were buried or you simply had forgotten were even there. This particular photo is one of my favorites. It was taken when I was probably a few months old. I’m being held by my sister and am with my two brothers. The film of 1979 isn’t like the digital technology of today, but I think this is one of the most beautiful photos in my possession. A perfect photo today means flawlessness, clarity, and jaw dropping color. A perfect photo for me, though, is looking at something and getting lost in it. The blur, the accidental lighting, the faded pieces of memory. I am a passionate amateur photographer and thank heavens that digital cameras exist for my artistic drive. But I miss how film allowed and even celebrated unevenness. Light that wasn’t well distributed, faces that are scrunched, looking away, blinking. I miss how film gave you limits and you simply had to accept whatever the shutter saw, no exception. If you were out of film, you were out of film. No double or triple pictures taken in sequence like we do now with digital. 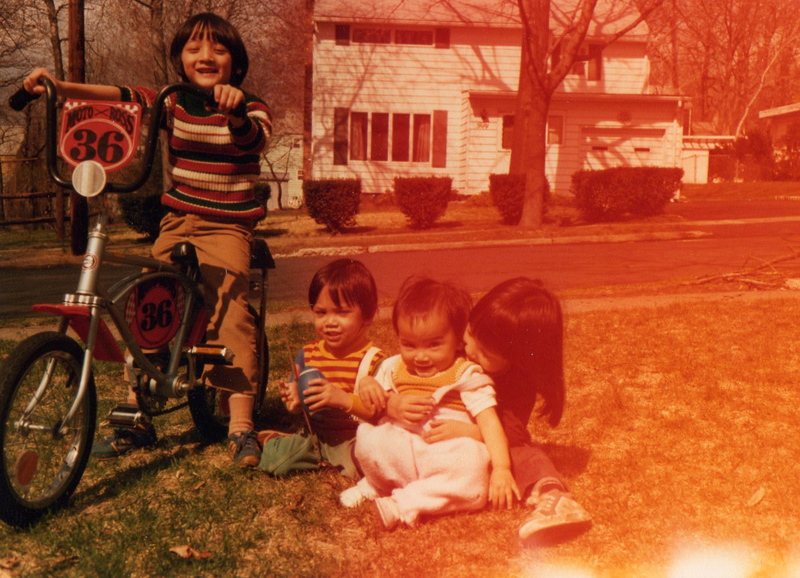 I love this photo as is…a picture of me and my siblings, with an old bike on the lawn of our New Jersey home is more precious than most of my technically superior images now. Film captures more than the subjects. It reflects our human nature for error and missteps. We are like that. Our lives are like that. Our memories are certainly like that. Beautiful. Uneven. Our personal memos to embrace our imperfect lives. Follow Dear Sister on Twitter!